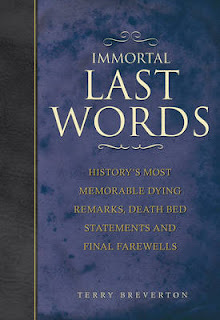 This is an interesting non-fiction collection of last words, comments, epitaphs, suicide notes, diary entries, letters, poems and much more belonging to famous and some not so famous people. Each phrase, remark or statement is presented in date order, with one page devoted to each entry. Each entry contains the person's name, their date of birth and date of death, the remark, statement or deathbed declaration chosen by the author, and a short bio of the person. The short bio provides enough background for the reader to understand the person's place in history, including how they passed. This is a perfect book to dip into from time to time; you don't need to remember where you're up to and you can flip back and forth as each page can be read in isolation. It's also a terrific way to absorb historical facts and information. "If the Persians [Medes] darken the sun with their arrows, we shall have our fight in the shade" spoken by Dieneces the Spartan in 480 BCE. Others were new to me: "I am ready to meet my Maker. Whether my Maker is ready for the ordeal of meeting me is another matter." This was said by Sir Winston Churchill on his seventy-fifth birthday in 1949; he wasn't to die until 1965. My favourite excerpt from the book were the last words spoken by Pancho Villa: "Don't let it end like this. Tell them I said something." Some statements and comments were funny, others were inspiring and some were reflective. I definitely recommend this book; I laughed, I learned and I was inspired. Sounds good! I like 'nibble' sort of books... and I always wonder what my last words will be. This would be an interesting book to leave on the coffee table and pick up every once in a while. I like the sound of this. I would love a book of fake ones. It's the perfect coffee table book, and a book of fake ones is an excellent idea!!! You could really have some fun with that. My last words would be: "tell them I said something inspiring", lol!